Talk about a Baby jhula, a baby bassinet or a baby cradle – it is definitely one of the most trusted baby gears since eternity. I have seen and known generations of parents using it for their children. It is one of the most convenient ways of rocking your baby back to sleep, especially in those first few months of life when the baby wakes up every couple of hours. Cut to times of today, Modern Moms know better than to just tug on to a string made of old dupattas and rock a hungry baby to sleep. So compiling here today is a list of features you can consider when buying a baby cradle or a baby jhula. A crib or a cradle, are both separate spaces for your newborn to sleep in. Cribs basically are smaller beds with high risen borders to prevent little ones from rolling off. Cradles usually have more features to them, and often can be rocked. Certain baby gear can make the Life of struggling new mom a lot easier. And with more awareness and associated modifications in our favorite gears, things couldn’t get better. There are cradles that come with features of rocking the baby by themselves. It is a great feature for you can lay your baby in the cradle, while the cradle rocks it to sleep. Make sure to check that the rocking motion is really gentle. It is possible that the baby may roll on onto its belly. By rolling on the belly, it becomes very difficult for newborns, especially if they have been swaddled. A self-rocking cradle saves you effort and soothes the baby to sleep. In any case, it is crucial to have constant supervision of the baby. When buying a baby cradles, ensure that it is fitted with a firm mattress. A loose or soft mattress can shift its position making it difficult to pick or lay the baby. The soft mattress can also roll up and cause irritation or difficulties to the newborn. When buying a baby cradle, check for the motor operation. How strong and effective is the motor, how noisy is the motor, does it cause some amount of unwanted vibration that is not comfortable for the baby? Consider these features before you zero down on a certain cradle. The Cradle must have a harness to protect the child and keep them in place. A harness that is not very tightening is ideal for little babies. This is also one of the most missed aspects when parents consider buying a baby cradle. If the cradle is motor operated, it would require power. The two most common sources of power are battery or through a socket. It is any day more economical and convenient to use a charger operated baby cradle. batteries are exhaustible and can exhaust any minute. This may render the cradle useless. With a charger handy, it makes more sense to just plug in and use as per convenience. When buying a baby cradle, look for double operation so you can use the cradle with our without a power source nearby. High-end cradles are also equipped with white noises now. From soothing sounds of water to other nature sounds, white sounds help babies sleep better and sooner. Ensure that the cradle you buy is of manageable weight for you. Just in case you want to finish a chore while the little one is sleeping, tends to help a lot. If you can move the cradle to and fro conveniently, you will be able to manage a home and a baby more effectively. 8. Wheels on the cradle. Always pick a cradle that is more compact. Eventually, the cradle is going to fit into your room. With something very bulky, it can get inconvenient to maneuver it around various locations, and will also occupy a lot of space in the house. Having said that, smaller cradles are more convenient to move on wheels. It helps to have a cradle that has a mosquito net or a cover to keep those nasty insects at bay. With a net or transparent cover, you can also take a quick look if the baby is awake or in difficulty. Remember to buy a baby cradle that looks pretty to YOU! Yes, to you! At the end of the day, more than the child, you will be looking at the crib. So if it does not appeal to you, it is going to be a cause of unwanted irritation for you. At least, I would have loved to have a cradle that seemed pretty to me. Irrespective of how high end your baby cradle is, ensure that the cradle has some functions available even without battery/electrical operation. If you are looking to buying a baby cradle with almost all of these features, then the R for Rabbit Lullabies Cradle is your best pick. From being adorably gorgeous to being sturdy with great features – R for Rabbit cradle is not something you can ignore. Very comfortable for the child, and very attractive to be in your room, it is the best combo of gorgeous and sturdy! Price: The Price of the Cradle is INR 8991. The product is often available at a discounted rate on online shopping websites. You may also like to read: Rashes? It’s not the Diaper, it’s the Polyester baby wipes! Disclaimer: This blog is a sponsored post. This is really an imformative post. I never knew one should look out for so many features while buying. Thanks for sharing! Well when it comes to buying baby products I most would go smitten by the cuteness . But yes you have pointed great points here. One should check many aspects. I wish I knew about these wonderful tips when I had my first child. I ended up buying a cradle that wasn’t too useful. Wow, I didn’t know buying cradles had so many perspectives to it. Safety is crucial and now there are so many great pointers you’ve given. 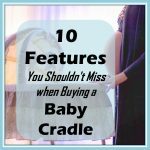 i never knew so much about a baby cradle, this has enhanced my knowledge! I can now suggest others who are looking to buy a baby cradle. This is a great tip and a really good product description. I would love to gift this to a friend who is expecting. Thanks for this great post. This is such an informative post. I knew we need to heed a few things before buying but didn’t realize there is so much to know. My baby cot had a cradle inbuilt which could be removed when baby was older.Loved your detailed review.